Dog pain relief formula can take years off your dog's legs and get your best friend running and walking the way they did years ago. 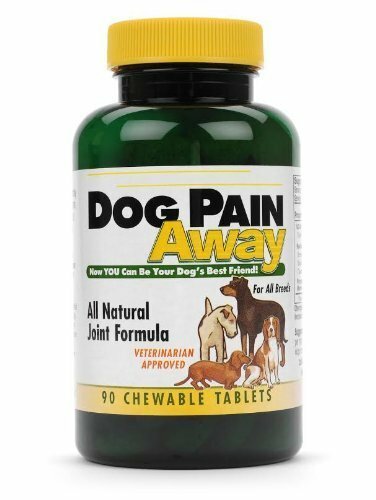 Dog Pain Away is a specially formulated, all-natural joint supplement to make your dog's pain disappear. Utilizing a unique proprietary blend of Type II Collagen, New Zealand marine extracts, and a revitalizing blend of herbs and enzymes, Dog Pain Away is an all-natural blend to prescription drugs. As veterinary services have improved, dogs are living longer and longer, and suffering more and more from the joint pain and arthritis that comes with old age. Dog Pain Away also treats decreased flexibility and movement, the wearing down of cartilage, increased synovial fluid production, and inflammation. Each ingredient was carefully selected and validated to optimize your dog's joint function and provide the building blocks for healthy joint structures. Take the years (and dog years) off your pup's legs with Dog Pain Away. Made in the USA.